UDM Downloads > Advanced DBF Repair! 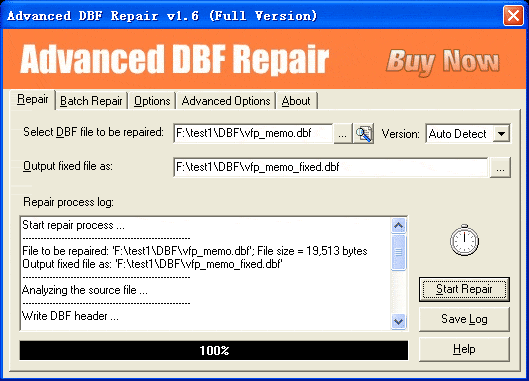 Advanced DBF Repair is a powerful tool to repair corrupt DBF files. It uses advanced technologies to scan the corrupt DBF files and recover your data in them as much as possible, so to minimize the loss in file corruption. Main Features: 1.Can fix all versions of DBF database, including dBASE III, dBASE IV, dBASE 5 for DOS, dBASE 5 for Windows, FoxBase, FoxPro, Visual FoxPro, etc. 2.Support to repair DBF files with memo or binary data fields stored in DBT or FPT files. 3.Support to split the DBF file when its size reaches a predefined limit, especially, support to split oversized 2GB DBF files. 4.Support to split the table when its field count reaches a predefined maxmimum field count. 5.Support to fix DBF files on corrupted medias, such as floppy disks, Zip disks, CDROMs, etc. 6.Support to repair a batch of DBF files. 7.Support to find and select the DBF files to be repaired on the local computer. 8.Support integration with Windows Explorer, so you can repair a DBF file with the context menu of Windows Explorer easily. 9.Support drag & drop operation. 10.Support command line parameters.